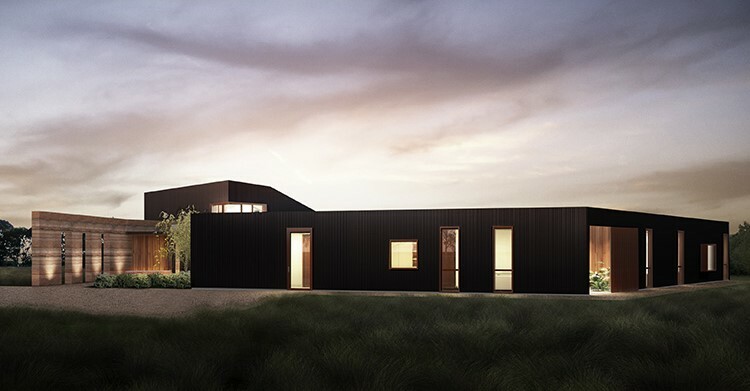 Currently under construction in rural Victoria, this residential dwelling has been meticulously designed to maximise the benefits of its environment and is a truly sustainable, self-sufficient, off-grid family home. It takes reference from the goannas which inhabit the area, basking in the sun during cooler spells to warm up and increase their metabolism. They lie perpendicular to the direction of the sun to maximise the amount of sunlight falling on them and darken their skin to absorb more heat into the core of their bodies. This design, like the goanna, has a tough outer skin of black steel, opening up through the use of large areas of glazing to the north under carefully positioned overhangs to allow for sunlight during winter and shade in summer. As the sunlight passes into the building’s core, a polished concrete slab and large feature rammed earth wall which runs through the centre of the building is passively warmed. This thermal mass dissipates heat when the temperature drops, regulating internal temperatures and reducing the need for supplementary temperature control. During summer, with the thermal mass completely shaded the building operates in the reverse, with the thermal mass acting to keep internal temperatures cooler. Energy conservation is central to the design. The building generates all its electrical power, hot water, and collects all its own water. An excellent thermally performing building envelope, coupled with energy efficient lighting, fixtures and fittings all act to reduce the overall power load. As well as being self-sufficient, this sustainable building maximises the benefits of living in the countryside, with all materials used in the building’s construction carefully specified and designed to avoid introducing any material chemical toxins and contaminants to the environment.